Ken Rosenthal of FOX Sports and Jeff Passan of Yahoo! 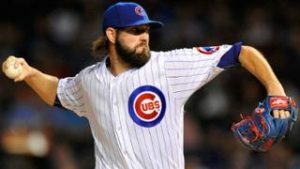 are the first to report that the Royals will sign former Cubs starting pitcher Jason Hammel to a two-year deal worth $16 million. Hammel went 15-10 last season with the Cubs with a 3.83 ERA, will join a Kansas City rotation that will include Danny Duffy, Ian Kennedy, and Jason Vargas. Hammel will take the spot of Yordano Ventura, who was tragically killed in a car accident.